Forget your hair worries with Estrella Vita Verde Anti-Dandruff Shampoo with Tibetan Ginger for Itchy, Irritated Scalp. 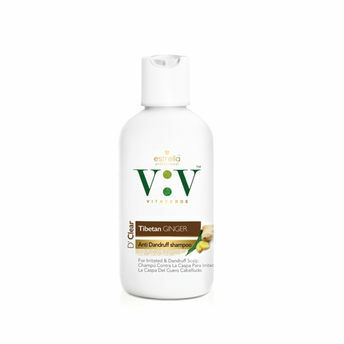 Vita Verde - D'Clear is enriched with Tibetan ginger along with other natural actives. This therapeutic blend has an antiseptic, anti-inflammatory property that mitigates dandruff and prevents its recurrence. This shampoo delivers smooth, shiny hair as a visible external benefit and an exceptionally healthy, nourished scalp from within. Expertise and know-how from international laboratories that are at the forefront of cutting edge technology, has been leveraged to develop break-through formulations, tested, highly effective and safe formulations with intensive study on emulating formation, structures and functions of biologically produced substances to leave your scalp fresh, clean and rejuvenated. Explore the entire range of Shampoo available on Nykaa. Shop more Estrella Professional products here.You can browse through the complete world of Estrella Professional Shampoo .